EDITORS NOTE: This is the third in a series featuring the 12 Brazilian cities that will host 2014 FIFA World Cup events. Brazil launched its 100-day 2014 FIFA World Cup countdown clock Tuesday. The world’s most highly anticipated football event (soccer to U.S. types) begins June 12 in Sao Paulo. Fortaleza, Brazil’s fifth largest city, will host World Cup matches on June 14 (Uruguay versus Costa Rica), June 17 (Brazil versus Mexico), June 21 (Germany versus Ghana), and June 24 (Greece versus Ivory Coast). Visitors to the city will find not only what are expected to rank among the World Cup’s most competitive matches, but also an intriguing city that seamlessly blends laid-back beach town with cultural hub. Fortaleza’s modern history dates to the 16th century, when Spanish explorer Vicente Pinzon made the first recorded visit to Mucuripe's Cove on Brazil’s northern Atlantic coast in 1500. Yet colonization did not occur until 100 years later, when Pero Coelho de Souza of Portugal built the Fort of Sao Tiago and founded Nova Lisboa (New Lisbon). Fortaleza emerged as the urban center of the state of Ceara in the 19th century, when abolitionist and republican movements also emerged and led to the emancipation of enslaved African-Brazilians in 1884, four years before slavery was outlawed across the entire country. The “Spiritual Bakery” movement of the 1892 further spread modern ideals and influenced Brazilian literature. By the 1920’s, Fortaleza had developed a distinct urban character as rural Brazilians launched a widespread exodus to cities. Fortaleza became Brazil’s seventh-most populated city at this time and by 1922 reached 100,000 residents. Today Fortaleza is the capital of Ceara, with a population of 2.55 million, making it Brazil’s fifth largest city. Locate within a relatively small 121 square miles, the city has Brazil’s highest demographic density. 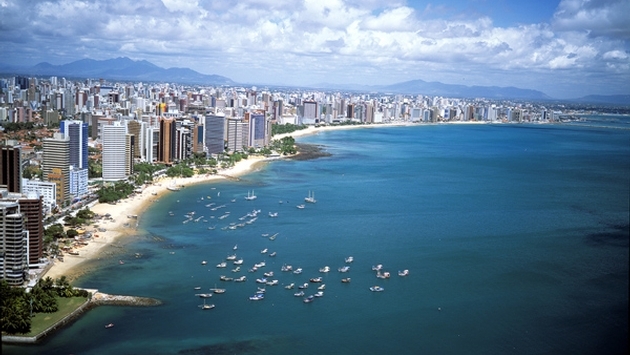 Fortaleza has a tropical climate, with high temperatures and relatively high humidity throughout the year, although the city’s ocean breezes tend to provide relief. Fortaleza features many one-of-a-kind landmarks and attractions. The Theatro Jose Martiniano de Alencar is a cast-iron, art nouveau theater opened in 1910. The facility features a variety of performance spaces and incorporates Brazil’s Center for the Arts Scenic. The theater is named after Martiniano, a Fortaleza-born romantic novelist who emerged as one of Brazil’s most important literary figures, focusing on works that explored Brazil’s culture and people. The cast iron elements that comprise the structure were imported from Glasgow, Scotland. Located in a large mansion, the Museu da Cachaca explores the history of the oldest manufacturers of cachaca, a traditional distilled spirit made from sugar cane that is an unofficial national drink. The museum features documents, photos and maps of the old sugar canes plantations and claims to maintain the world’s largest wooden barrel. Fortaleza’s Cathedral Metropolitana, located in Pedro II Square in the city’s downtown district, was inaugurated in 1978 after spending nearly 40 years under construction. The majestic church is executed in moderate Gothic style and replaces the old Cathedral, which dates back to 1854. That structure was demolished in 1938 after cracks were found in the building’s foundation. The current church is prized for its beautiful stained glass windows. In general, Fortaleza is a city of urban parks and picturesque seafronts populated with hospitable residents (“Fortalezenses”). The Praia do Futuro district features 16 miles of beachfront huts and tables for oceanfront dining. Locals and tourist alike visit the area for a swim in the ocean, drinks with friends and fresh local seafood, including crab dishes, fish stew, sea salt-roasted pargo fish and peixada cearense, a blend of fish marinated in lemon and garlic juices. Fortaleza’s World Cup matches will be held at the Estadio Placido Aderaldo Castelo, also known as the Castelao or Gigante da Boa Vista, a state-owned stadium inaugurated on November 11, 1973 and named to honor Castelo, a former governor who led an effort to build the structure. The Castelo has been re-developed for the World Cup. The Coco Ecological Park is an urban beach park with volleyball courts. Visitors can also opt to stroll the seafront of Calcadao de Iracema or watch the sunset from Pont dos Ingleses. For a day trip, travelers can drive to Jericoacoara Beach, located 180 miles outside of Fortaleza and considered among the world’s most beautiful beaches. The best of Fortaleza’s nightlife can be found in the Aldeota and Varjota neighborhoods. The former features high-end gastronomic restaurants while the latter is a revitalized district of bars and nightclubs. There are currently no airlines flying directly from the U.S. to Fortaleza. However most of the carriers flying to Brazil from the U.S. (American Airlines, Avianca, Delta Airlines, LAN Airlines, TAM Airlines, U.S. Airways and United Airlines) fly to Sao Paulo, Rio, Manaus or Brasilia, from where travelers can connect to flights to Fortaleza. Make sure to bring a camera during evenings in Fortaleza as the facades of several iconic local buildings, including the Palace of Abolition, Cathedral Metropolitana, statue of Iracema, and Portugal Square will be illuminated in the green and yellow colors of Brazil’s flag.